Is This The Next Uber? Aline Sara, 30, sat at her computer in Beirut, Lebanon, ready to explain to a reporter the details of NaTakallam, a business she’d started with former Columbia University classmates Anthony Guerbidjian, 28, and Reza Rahnema, 27. Before she could begin, the electricity cut out. After a few moments, the building’s generators restored power and she continued the interview, working around what for her is just another everyday challenge facing her new company. NaTakallam’s success could be a game-changer in the way students learn and practice new languages. The company is an online platform for connecting students and professionals interested in practicing their conversational Arabic, pairing clients with native speakers living in Lebanon, Turkey, Egypt and Europe. Sara, who grew up speaking French and English, said she came up with the idea for the company while trying to learn and refine her own spoken Arabic. She was living in New York City and couldn’t find a conversation partner to her liking. “I just wanted to be conversing,” she said. Private tutors were “very expensive” and she didn’t have the time to invest in a full language course. After setting up a business plan and entering a couple startup competitions earlier in 2015, the company began taking shape over the summer. By early July, the three co-founders had launched a pilot project with five conversation partners and 15 language students. NaTakallam expects to find success by mixing technology and social enterprise. 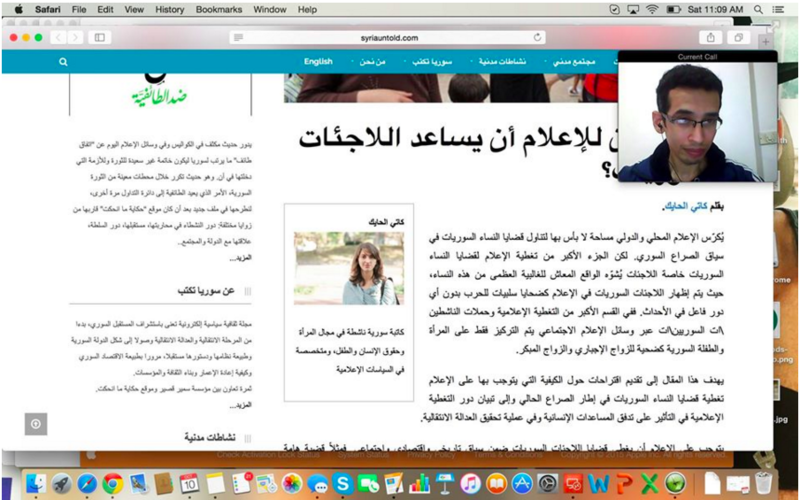 The company uses online tools like WhatsApp and Skype to link clients in the United States with Syrian conversation partners. Sara and her co-founders decided that building a bridge between their clients and the large number of highly educated Syrians fleeing their country’s civil war would be a win-win. Recognizing a strong interest in the United States for flexible, low-cost language practice, NaTakallam is working to lower the barriers between native speakers and its customers. Over 100 customers, ranging from filmmakers to expats, have purchased practice sessions. After signing up, they buy hour-long blocks of time to practice either standard Arabic or the local Levantine dialect. Based on information collected by NaTakallam, such as a customer’s familiarity with Arabic and his or her interests, clients are individually connected with Syrian practice partners. “We’re really making an effort to make sure people are compatible,” said Sara. It’s one aspect of the process that isn’t as dependent on technology. “We don’t use an algorithm or anything like that to match people,” she added. Conversation partners are screened for more than just their ability to speak the language. “We hold an interview with them and assess their interpersonal skills,” Sara said. The majority of the partners are young adults between the ages of 20 to 30 and come from a variety of backgrounds and industries. After pairing the client and the partner, NaTakallam coordinates busy schedules that span the globe. Using web-based applications like Doodle and Calendly, they to hammer out time slots for language practice. “We really try to work with people’s schedules,” said Sara. Time zones are a persistent obstacle. “We have a lot of people in the U.S. that want to meet after work, but that’s midnight in Beirut,” she noted. So far they’ve been able to work out solutions. “People are usually pretty understanding,” she said. As the company continues to build its network of partners and clients, it faces some challenges. So far none of the co-founders are turning a profit, according to Sara, but they are bringing in enough revenue to defray their travel and technology costs. Their ultimate goal is self-sustainability and while they’re presently exploring the option of public funding, they’re wary of the conditions that may accompany those offers. As their business grows, NaTakallam’s founders are excited about the future of the company. “We would love to be able to expand this.” Sara said. “Definitely down the line—why not?” For now, Sara and her co-founders are focused the company’s sustainability and success.